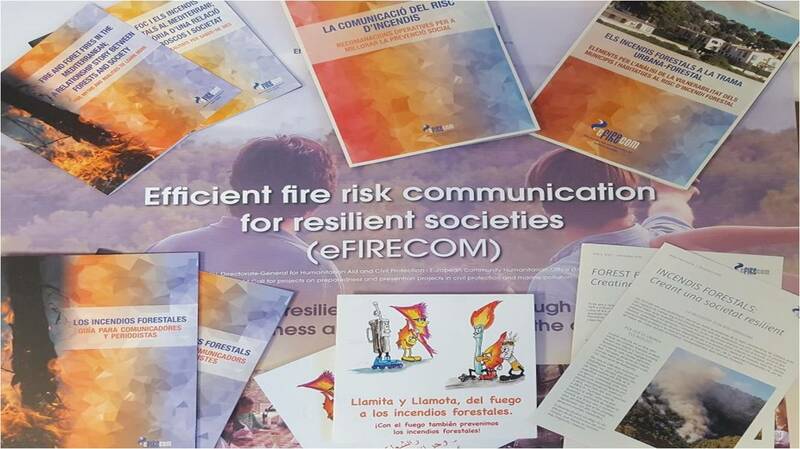 The results of the project Efficient fire risk communication for resilient societies (eFIRECOM), are now available. The project has brought together actors from all over the Mediterranean region in order to evaluate and develop new tools to facilitate the understanding of the forest fires phenomenon and the awareness of their risks. The objective is to promote knowledge and understanding of risk, in order to enhance social responsibility in the prevention and protection of forest fires. The tools and resources are aimed at different audiences, from children to municipal technicians or communicators, and bring us closer to the world of forest fires and its mains challenges and solutions that we must face as a society in order to continue enjoying the landscapes with safety. The project, which lasted two years, has been coordinated by the Forest Sciences Centrre of Catalonia, along with EFIMED, PCF, FORSPIR, the Tunisian DGF and the University of Batna (Algeria); and co-financed by the Directorate General for Civil Protection and Humanitarian Aid of the European Commission (DG ECHO 2014 / PREV / 13). Here you can consult the different outputs published in the framework of the project.